This awesome Free Floating catamaran suite is a mini eco lodge designed and built for visitors to national parks in The Netherlands. 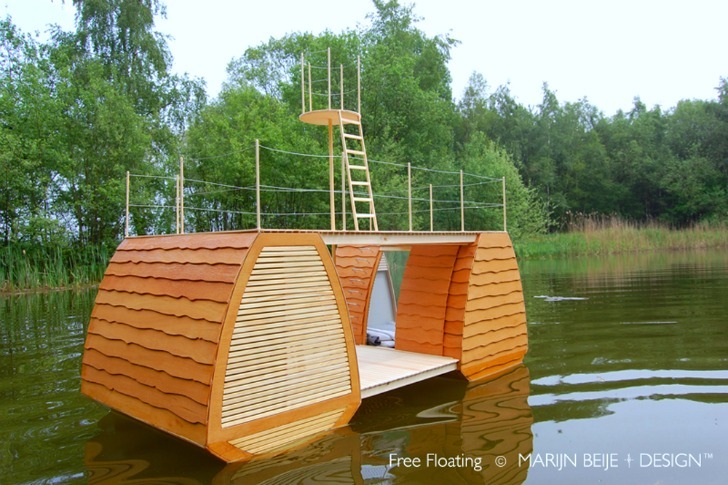 The floating retreat was designed by Marijn Beije, who wanted to make nature appealing and more exciting to the general public - he sought to get people out of their homes and away from their tvs and gadgets so that they'd appreciate nature more. His cute and sustainably built Free Floating mini lodge gives visitors front row seats to the splendor of nature. Nature often has to compete for our attention with the interweb, video games, our iPhones and other forms of digital media. Beije figured that people would get outdoors more often if it was easy and comfortable to do so – hence her cozy floating cabin. One side of the building features a bedroom with two beds that fold down and look out over the water. During the day, the beds can be pushed into the wall to provide plenty of space for lounging and observing. The other side holds a spa-like bathroom, which is connected via a covered and open living space. A top-level deck provides space for sunbathing, and a crow’s nest 6 meters above the water is a perfect spot to catch a better glimpse of the birds. Beije partnered with Ap Kremer from APHoutconstructies, a company from western Holland, to build the lodges. Sustainable materials and manufacturing processes were used to realize the design and construct the catamarans. By crafting a comfortable and sustainable place to rest, stay and sleep, Beije hopes to inspire more people to get outside and take advantage of the parks in his country. That is a simple and elegant design. I like it. Nature often has to compete for our attention with the interweb, video games, our iphones and other forms of digital media. 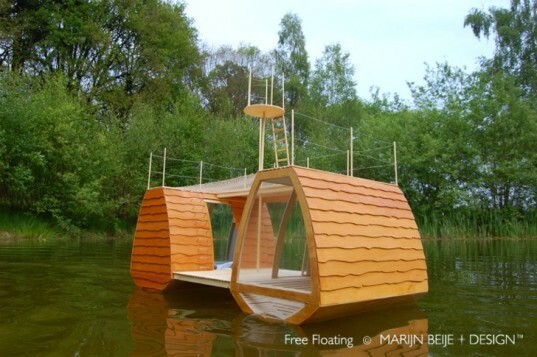 Beije figured that people would get outdoors more often if it was easy and comfortable to do so - hence her cozy floating cabin. One side of the building features a bedroom with two beds that fold down and look out over the water. During the day, the beds can be pushed into the wall to provide plenty of space for lounging and observing. Sustainable materials and manufacturing processes were used to realize the design and construct the catamarans.